It was one of my best friend’s birthdays today!! Most of my friends know that you’ll be getting a sweet treat if I’m around for your birthday, and she asked me to make her a healthy cake, so I went on a mission… I poured through paleo recipes and finally settled on this one by The Paleo Mom. I’m pretty sure I could have made it into a cake, but she was ok with cupcakes, so I settled on that – it’s easier to share with a group of people for sure! I changed a couple of things, but stuck to the recipe for the most part, and it doesn’t disappoint! Dinner was over, and it was dessert time!! 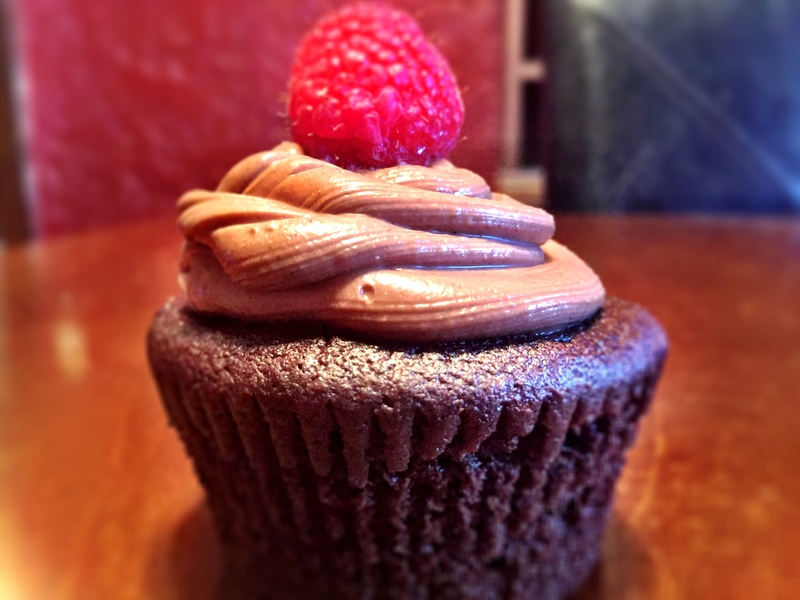 I had prepped the group by saying – okay – this is a healthy cupcake people… (minus the chocolate chips). I down-played the awesomeness of this cupcake because I don’t think i remembered how awesome it was! Everyone couldn’t believe they were eating an (almost) all natural cupcake. Healthy can be good, peeps!! Like, really good!!! My recommendation is to make the frosting the night before and let it sit overnight. I actually made the cupcakes and the frosting the night before then put the frosting in the fridge to set even more and chill. I iced right before serving so that the ganache didn’t melt and could hold the raspberry. I also added more chocolate chips in the batter before baking to add a little chocolate and crunch to the cupcakes – a great addition in my opinion. 🙂 Also, you can use paleo chocolate chips or melt chocolate that is under the paleo guidelines to make this recipe completely paleo. Enjoy these chocolatey delights, my friends!! Perfect for a birthday or just for a chocolate fix! 1. Melt chocolate on medium power in the microwave or over low heat in a saucepan on the stove. 2. Combine melted chocolate and coconut cream (it’s okay if the cream is at room temperature or cold from the fridge). Blend until completely smooth. Let sit overnight at room temperature to set so it’s thick enough to pipe. 1. Line a muffin pan with muffin liners. Preheat oven to 350F. 2. Melt chocolate and coconut oil together on low power in the microwave or in a small saucepan over low heat on the stove. Let cool several minutes. 3. Place eggs, vanilla, and salt in a blender or food processor. Blend briefly to beat the eggs. Add a small amount of the chocolate mixture and pulse again to temper the eggs. Then add the rest of the chocolate mixture and beat together for 30 seconds. 4. Add the cocoa powder, coconut flour and baking soda. Blend to combine (maybe another 30 seconds). Add in extra chocolate chips if you want! Don’t blend these in – just mix. Let the batter sit for 2-3 minutes to thicken. 5. Pour the batter into the prepared muffin pan (cups will be filled about ¾ full). Bake for 17-18 minutes. 6. Carefully remove from muffin pan promptly upon removing from the oven (use a knife to gently pry them out as opposed to dumping them all out). Let cool to room temperature before frosting (pipe the frosting or just spread with a knife!). Top with a raspberry! Enjoy! Chocolate with coconut is a gr8 combo!